In March, 2009 I made the decision to upgrade my first HF antenna, a Newtronics 6-BTV. This vertical worked very well for 2 years given my restrictions and backyard dimensions. 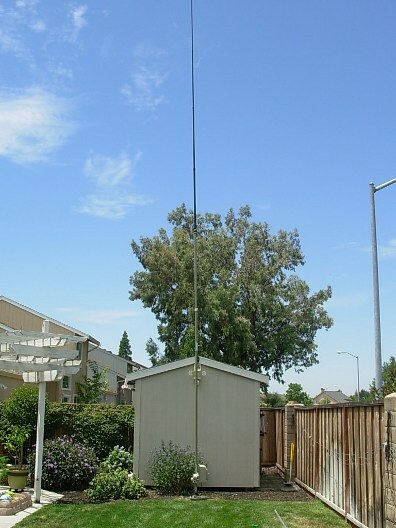 I had the antenna ground mounted with 45 radials, varying in length from 21′ to 45′. I began reading reviews and asking questions on what possibilities were available. The main consideration were the CC&Rs I had to abide by. Thankfully I had received an exemption from the HOA and management company in order to erect the 6-BTV, which NEVER received any complaints the 2 years it was used. I then made a side trip to K6LRG, sponsored by the Livermore Amateur Radio Group Endeavors, located on a hilltop in Patterson Pass, above Livermore, CA. I was surprised to see a SteppIR BigIR Mk III as one of their main antennas. I joined the SteppIR Yahoo Group in order to gain more information about the antenna and continued to shop for other alternatives. A beam on a tower was not possible, neither was anything aerial mounted on the roof. After reviewing my choices I decided on the SteppIR BigIR Mk III. Two month later I placed a call to SteppIR in Washington and ordered a SteppIR BigIR Mk III. While it was not cheap after adding the 80M coil, control cables and controller it was a worthy upgrade from the 6-BTV. At 32′ it was considerably higher than the “20′ vertical” I was able to get exemption for (okay so it was really 24′). The vertical arrived about 3 weeks after the initial order, about 2 weeks prior to that I received the controller and the cables and began the installation.